There is a new option in weight loss surgery - the Orbera® intragastric balloon. What is the Orbera® intragastric balloon? The intragastric balloon is designed to be inserted into the stomach and inflated to a volume which will restrict the amount you can eat and reduce hunger. It is easily and simply inserted through the mouth under a light anesthetic. It is performed as a day case procedure in hospital. What sort of weight problems is the Orbera® balloon designed to help? The main aim of the Orbera® balloon is to help people with a BMI between 30 and 40.There is good evidence that people with this sort of weight problem can, after losing the excess weight, retrain themselves and change their lifestyles to enable the weight loss to be maintained. What other reasons are there for using an Orbera® intragastric balloon? The Orbera® intragastric balloon can help patients to shed 20 to 30 lbs of weight relatively quickly. It may be used in patients with BMI between 30-40 as a short term measure when rapid weight loss is critical. An example may be someone requiring urgent hip or knee surgery where the orthopedic surgeon requires weight loss before going ahead with the procedure. How long can the Orbera® intragastric balloon be left in the stomach? It is important that the balloon be removed after six months. Eventually, the balloon, which is made of silicone, degrades and may rupture, causing serious injury. We will not perform insertion of an Orbera® intragastric balloon without your written agreement that you will have it removed in six months. Can a second Orbera® balloon be used after removal of the first one? Yes, but we recommend at least four weeks between removal of the first balloon and insertion of the second. Costs of a second balloon will be a little less depending on the degree of ongoing support required. Similar side effects to the first balloon will probably be experienced. Can I go back to work straight after having the balloon inserted? Definitely not! 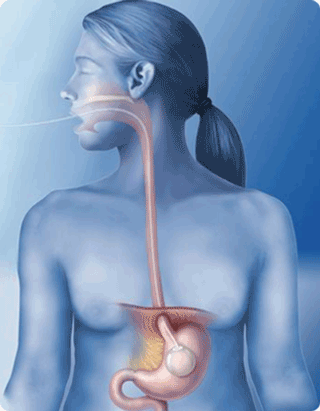 For 3 to 5 days you will be VERY uncomfortable and may experience nausea, vomiting and cramping-type abdominal pain. You will be helped through this phase by your provider team with appropriate medication prescribed. In some instances you will need to be admitted to hospital for a few hours or even overnight to be re-hydrated with an intravenous drip. The vast majority of patients will be able to return to work within a week. Will I feel the balloon and will I be restricted in any way whilst the balloon is in place? In most cases, after the first few days, the only sensation you will have is one of fullness and lack of appetite. Normal activity and exercise is unrestricted. In rare cases, the balloon may move from its position in the upper part of the stomach to the lower part and may be felt as an "alien" in the abdomen and this may be associated with some vomiting. By lying on your left side and gently massaging the "alien" it will easily go back to its proper position. We would love to hear from you. Call our office at 860.246.2071 and dial option 2. You can also visit www.orbera.com.